This page comes from my May 19, 2011 post that covered Shakeology and Boost Fiber as my favorite supplements. But I have saved the best supplement for last. Shakeology! I have written more about Shakeology in my blog than any other supplement for a reason. In fact, it has it’s own section, entitled “Shakeology Corner”. This area has videos, print materials, letters from doctors, ingredient lists, O Magazine article, and more. I try and keep a tempered and balanced approach to all things, but this product is literally the best supplement out there. If you can only afford one supplement, Shakeology should be it. Take a quick look at these (2) video if you haven’t seen them yet. Then, I’ll explain why this is my #1 supplement and why the product offers unbelievable value for the money. “Nature in a Bag” just isn’t a cute phrase. It’s what Shakeology does. Follow the Ingredient Hunter as he brings Shakeology from the highest cliffs and densest jungles of Peru to a kitchen near you. See What Doctors Are Saying About Shakeology! Doctors across the country are using Shakeology, and many are recommending it to their patients. See what the medical community thinks about the healthiest meal of the day. Why is Shakeology My #1 Supplement? – Ginkgo Biloba – Check! And what really sets Shakeology apart are its Superfoods and Proprietary Blends of Super-Fruits, Probiotics, and Enzymes. This is the real magic and where Darin Olin (the Ingredient Hunter) has spent so much time sourcing the best raw materials. (More on this below.) For a description of the Full Ingredient List, CLICK HERE. Not sure what Sacha Inchi is and how it helps you? It is all explained there. Look down the list of ingredients and try and source them yourself! 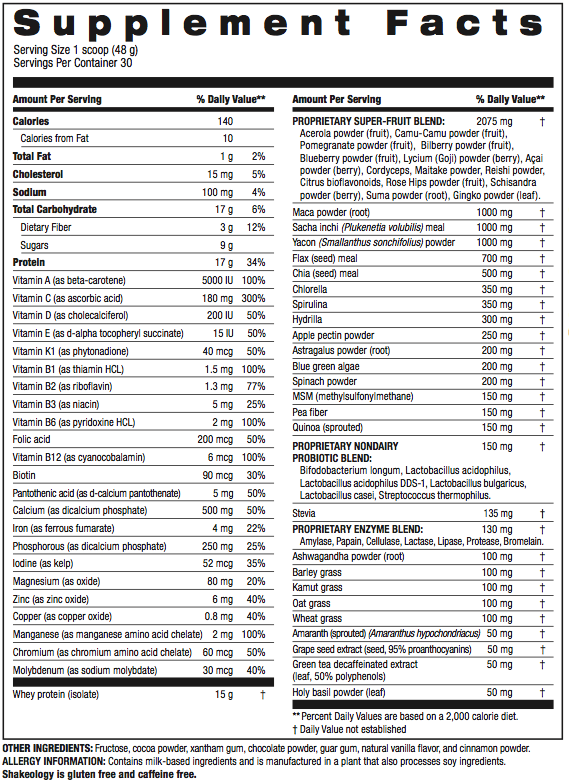 Add up a high quality MVM, Whey Protein, and all the ingredients in the proprietary blends. We live in a world of $4 / day habits. Fast Food is typically $5+. Starbucks and Jamba Juice are $4+. A soda from a vending machine is $1 and it has no nutritional value at all. Shakeology replaces a meal and it is the healthiest thing I can put in my body, unlike the other things. Oh yeah, it tastes fantastic as well. So for me, this was more of an exercise of shifting funds around rather than seeing where I could get an additional $4 / day. As I have said with all my supplements, you get what you pay for. This is an ultra premium product. You will not find the breath and depth of nutrition in any other product with a taste this fantastic. And here is way to get your costs below $4 / day. When you become a coach, you save 25% off the product which really helps! In fact, you would spend more money as a retail customer than just becoming a coach and paying the $14.95 monthly coaching fee so you can save 25% on the product. Hence, I recommend that anyone on Shakeology HD become a coach because you will save $15 / month. Here is a quick clip from Carl Daikeler, Beachbody CEO, along with an add up of what you need to buy to equate to the nutrition you get in Shakeology. I have experienced personal success with Shakeology. I feel so strongly about the product because I have seen it work for me and so many others who are taking it. However, this is not a magic potion. You still need to eat healthy the rest of the time. But with a healthy diet, I saw my cholesterol do a complete 180. – Total Cholesterol – 195 to 146. – LDL (Bad Cholesterol) – 124 to 73. I just had my blood work done again recently and my cholesterol has even improved a little beyond these numbers. You want HDL to go up and LDL to go down. I wasn’t in the “red zone” yet, but in another year or maybe even less, I would have been there. Guaranteed. I am honest with my reviews and will tell you if something is not up to snuff. This product delivers on everything it promises. However, I will be transparent and say I am not a personal fan of the Greenberry flavor. Many people like it, but it is not for me. I highly recommend trying the Chocolate flavor first. Here is a quick video of how I make mine. Notice the annotation that I use PB2 now in lieu of Natural Peanut Butter. Same great taste. Way less calories and fat! The last supplement I use is Shakeology Boost – the Fiber. I used Benefiber for a while and then switched to this product. It contains 7g of fiber which gives me a total of 10g since Shakeology already has 3g. It also hits another key supplement by adding in some L-Glutamine. I add this in with my Shakeology every day. This is a very high quality fiber supplement. You can download a quick product brochure on Shakeology Boost – The Fiber HERE that compares it vs. others on the market such as Metamucil and Citrucel. The Fiber has (5) sources of fiber and almost all of the fiber is soluble, which is what you want. Oh yeah, many others contain artificial sweeteners and flavoring as well so watch out for that. I am an extremely strong believer in the Shakeology product. In fact, I am so excited for you to experience the benefits and see the results of the product, that I am willing to give you a free tasting on my dime. Just click HERE to see how you can get a free sample. If you like the taste, try the product risk-free for 30 days. Beachbody has a 30 day bottom of the bag guarantee. If you are not 100% satisfied, I will help you return it and get your money back. The timing could not be more perfect for this blog, This week, Darin Olin talked on the National Coach’s Call. Carl Daikler, Beachbody’s CEO, has a great blog on the discussion. You can look at his blog HERE and I have also pasted it below. Additionally, I have clipped Darin’s section out of the call. You can download it HERE. You get a real sense for the sensitivity around this product and the fact that each batch needs to be tweaked given seasonal changes in taste in the raw ingredients. I take it for granted that I get a bag of this “stuff” every month delivered to my doorstep. This really helps you appreciate how much goes into the continual sourcing of the highest quality ingredients and how we are also changing lives of local farmers in other countries by helping them grow their economy. On Monday’s call Darin Olien gave some great insight into the creation of Shakeology, and what it takes to maintain this complex one-of-a-kind formula.Not only did he describe his recent travels through Asia, he closed out with an emotional “bang” about how Shakeology is truly changing the world, helping farmers supply the powerful super foods and in turn creating economies in some incredibly impoverished areas. Everybody wins with this shake, truly… Healthy on more levels than we can even describe. But even if you didn’t catch Darin this morning, you can learn more about his adventures—and how the creation of Shakeology is actually raising the bar on global farming standards—in the soon-to-be-released Shakeology® Book 1! Darin, our “Ingredient Hunter” recently went on a global trek to source some of the Shakeology ingredients in Peru, Indonesia, and other countries. In this book, you’ll be on the road with him as he describes his adventures in nutritional exploration. If you drink Shakeology® you will be captivated by what is in this extraordinary product, and what goes into making it so. 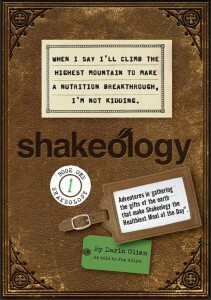 As a special one-time gift, we’ll be including the first volume, Shakeology: Book 1 (catchy!) in all Shakeology® shipments for a month, beginning mid-June. Cool, right? Enjoy it, give me feedback, and know we wouldn’t call it book one, if there wasn’t gonna be a book two.